Bow Street Flowers - A daily record of life in a small flower shop: England? Every time we have a wedding at the Crane Estate, I swear this is the area of the New England coast where I want to live forever. Most folks come this way to go to Crane's Beach. 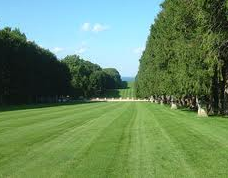 Visitors can pay to see the Estate on the hill above the road and some do. Mostly the Mansion is used for weddings and Events. The alle from the house to the ocean is spectacular. Our bride's wedding today was in the Guest Cottage at the bottom of the hill. It's a sweet house where the bride and her family can stay for a few days before the wedding. They can walk to the beach and enjoy all of the natural gorgeousness. Did I get photos of the flowers? Non. But I did get photos from this weekend. Wedding at Memorial Church in Harvard Yard. The reception was at the Harvard Faculty Club. One more. Personal flowers delivered to St. Cecilia's church in Back Bay on Saturday. Lighting wasn't great, but it looks peachy, huh? 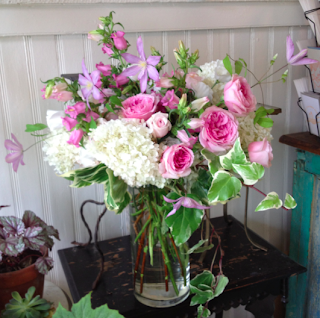 I skipped flowers in the house at Jane's today. How many hydrangea can I showcase on my mantle? Plus, out early to finish today's wedding on the North Shore. Next time, Jane! I promise. I went to Crane's beach once--it was beautiful, and I remember seeing the manor on the hill and wondering what it was. Your Harvard Church flowers are beautiful. Oh what a beautiful place ... to have a donkey!! I think Jane can bend the rules to include these at the party. And you're just fashionably late.